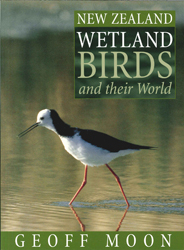 New Zealand Wetland Birds And Their World - ubiq bookshop: the best place to buy books! Wetland Birds launches a major new series of habitat-based books on New Zealand bird life. In his introduction, Geoff Moon presents all the major types of wetland found in the country. The greater part of the book features entries on each of the birds that use New Zealand's wetlands on a permanent or seasonal basis. A lifetime's worth of fabulous bird photography is accompanied by lucid text enriched with Geoff's own personal observations, all collected from more than 60 years' experience, crouching among reeds or standing statue-still in a hide with his camera. Some of the country's most elusive birds are found in wetlands; most of the photographs of the fernbird, bittern and dabchick that feature in this book are not only previously unpublished but are also among the finest images available of these hard-to-shoot species. Featured in the 9 February 2009 New Zealand newsletter.